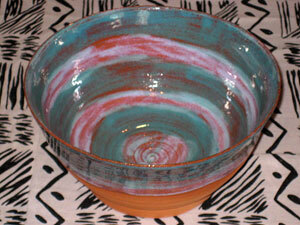 Handmade Pottery by artist Elsie Cogar. Each item is formed on the potters wheel, not from mold making. The platter, bowl, plate and mug are unique in size and shape and identified as a set through the design, color or concept. 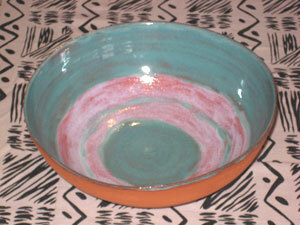 Products are either hand painted with under glaze and then glazed or hand painted with glaze. They are functional artwork usable and aesthetically pleasing, making each moment or event special. Objects of symbolic and ceremonial significance. These vessels have their own unique feel and texture, being handcrafted and handmade allows me to create each and every item with a good quantity of the material making them feel natural and heavier than conventional dishes or home wares. However I am able to modify the thickness if you prefer fine pieces. These bowls, platters, plates and mugs have a special feel when you eat or serve food in them. 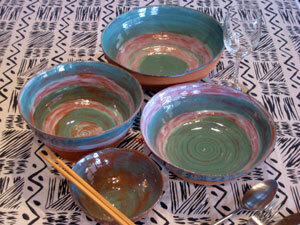 Handmade terracotta pottery bowls are lead-free, dishwasher, microwave and oven safe. Each item is formed on the potters wheel, not from a mold making each handmade pottery bowl a unique size and shape and identified as a set through the design, colour or concept.